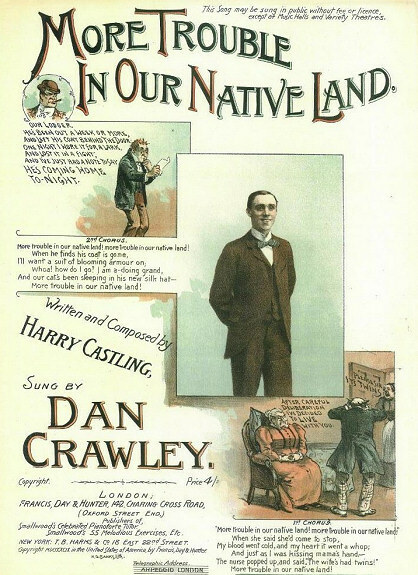 Dan Crawley (real name Daniel Crowley) was born in County Cork, Ireland in 1872, moving to London with his parents when he was six years old. By the time he was sixteen, he was appearing as a dancer, subsequently branching out as a comedian. 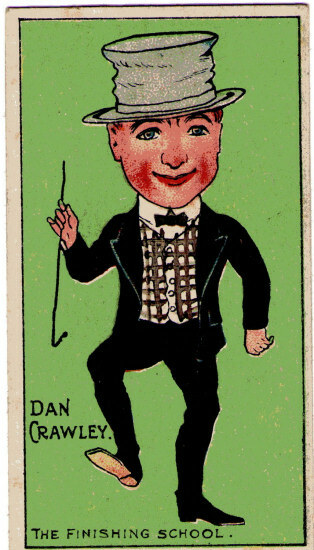 Dan won many trophies for his expert dancing, which was always to be a feature of his act. 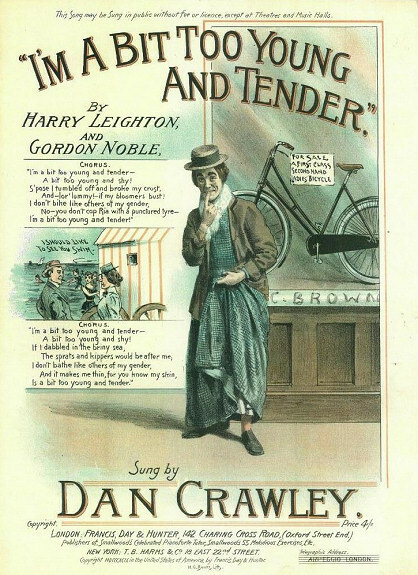 His first recorded London appearance was at the Royal Victor Music Hall, Victoria Park on 9th March 1891, when he was 19..
For several seasons, starting in 1892, he was a popular performer at "Chappell's Ring" on the sands at Great Yarmouth, an alfresco show that (weather permitting) performed three shows a day at 11am, 3pm and 7.30pm. This was hard work, but good experience for the performers, and such future stars as Arthur Roberts and Harry Pleon took early steps on the ladder to success here. Dan Crowley & Lilian Bishop were married in Hackney in June 1893, their first child Ellen was born in 1897 - and there followed another four children over the next thirteen years, Lilian, my grandmother (1899), Margaret (1905), Dorothy (1909) and finally a boy, Jack (1911). The large family didn't seem to affect either parents careers, and both Dan & Lilian continued to tour round the country together as well as appearing frequently in London. 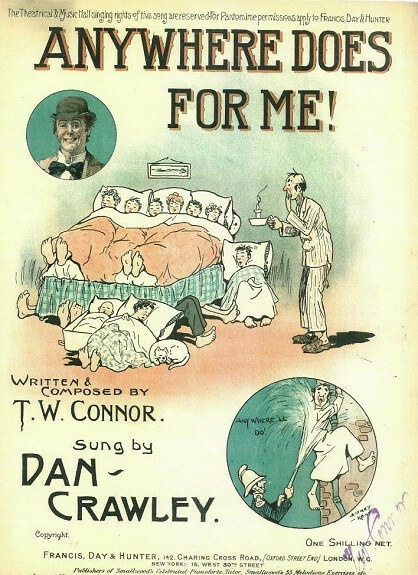 Dan had a large repertoire of comic songs, many of which can be found in the Bodliean Library at Oxford University. Some of his hits included "Now That You're Married I Wish You Joy", "Father Keeps On Doing It" and "Anywhere Does For Me". 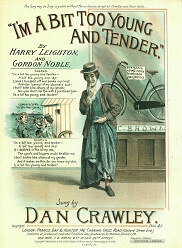 He was particularly successful as a pantomime dame, and later in his career incorporated the 'portrayal of elderly ladies in reduced circumstances' into his music hall act, with songs such as "I'm A Bit Too Young And Tender", "It's Only A Way I've Got" and "The Mice Have Been At It Again". On several occasions he was billed as 'Dame Dan Crawley'. 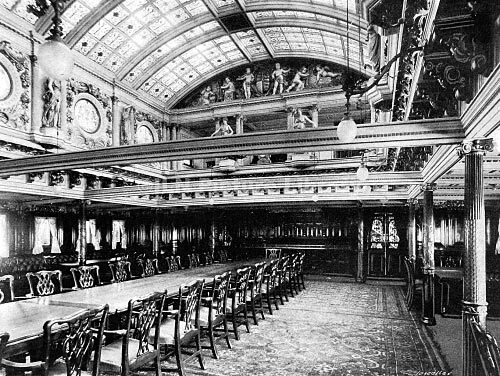 On 26th March 1903, the Stage reported in its' gossip column that "Mr Dan Crawley, one of the foremost comedians and dancers of the variety stage, sails per S.S. Ophir tomorrow, in company with his wife (Lilian Bishop), to fulfil engagements in Australia." At this time Dan was 31 and at the peak of his career, his wife 27. 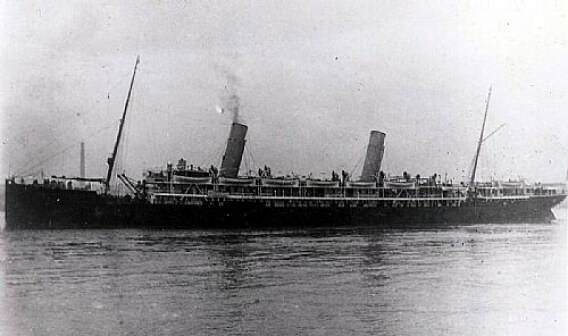 The journey would have taken them via the Suez Canal and lasted 103 days. 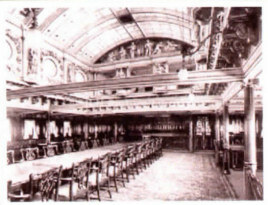 In October the stage proudly reported that they were both a hit at the Tivoli Theatre in Sydney, and reviews had named Dan as "one of the best comedians so far imported by Mr Harry Rickards", who was the owner of the Tivoli, an impresario who had allegedly "fled to Australia to escape creditors"! Lilian suffered from health problems, which resulted in her retiring from stage work in 1912, and also in that year Dan died suddenly, aged only 41, from complications following a lung operation. 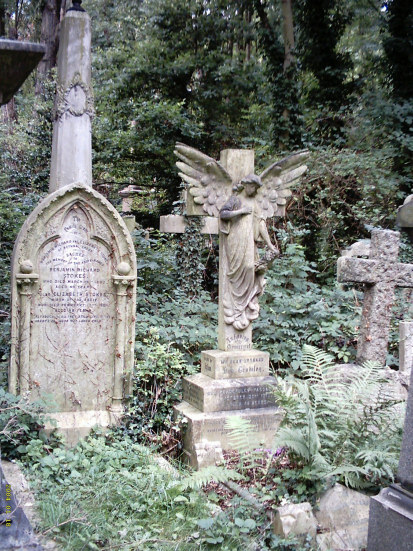 Five years later - also aged only 41 - Lilian also died, by which time she was in the Brighton County Borough Asylum in Hayward's Heath, West Sussex. My grandmother Lilian was left at the age of 18 to bring up the three younger children. Fenton has been reviving some of Dan Crawley's songs, most recently at an Old Time Music Hall evening with Billy Bragg at the historic Hoxton Hall, which formed part of a BBC Radio 3 Documentary on the legacy of the Music Hall. 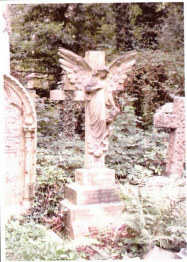 A play based on the lives of Dan & Lilian is also in development. 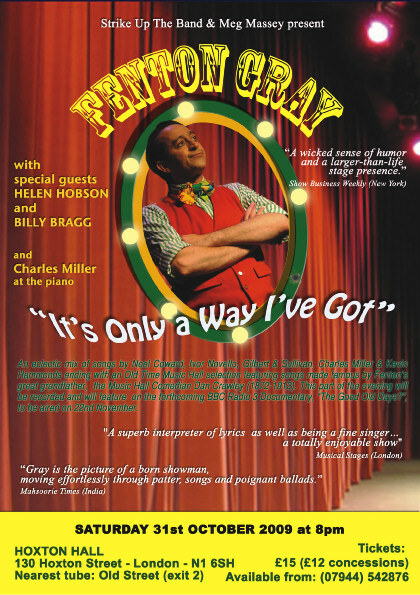 Fenton Gray singing �Father Keeps On Doing It� as sung by Dan Crawley. "I had some very good scenes too, with a stage polar bear and there was a rich bit of comedy fooling between Dan Crawley and myself, both of us dressed up as women and talking scandal over a cup of tea and a cookie. 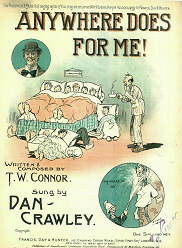 Every now and then I poured a "wee drappie" from a half-mutchkin bottle into Dan's tea and the way he and I acted the garrulous women gradually getting 'fou' was one of the hits of the show."